Steve Katz is a FinKraft Coached Multi-sport athlete and he also represents our FinKraft Multi-sport Team with great success and dedication. After surgery to repair a couple of hernias I made the decision to pull the plug on doing IM Mt Tremblant and do HITS Hudson Valley in Kingston to give myself some extra time to recover and get in a few more weeks of training. I spoke about the plan with Roger originally thinking I would do the Olympic distance at HITs and he said “Why not do the half?” I wasn’t sure of my fitness but I trusted in his confidence and the training plan he laid out. Training for the race went well. We started off very easy after my surgery to avoid any complications and then added in some shorter intervals and tempo work. Week by week I felt better and better and started to really feel I was getting into good form. I tested my form at a local 10k and popped off a very solid run. That was a good confidence boost. 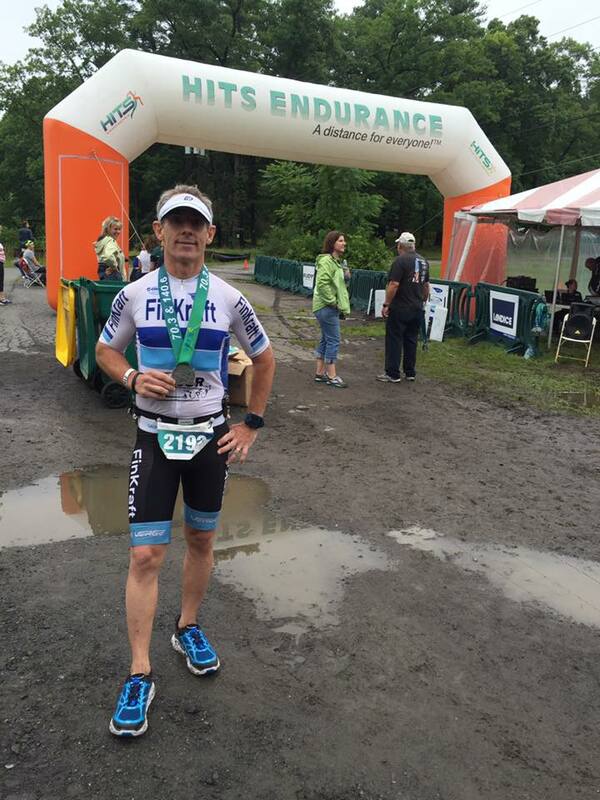 I next raced the Wyckoff Tri and that was a huge confidence boost. I had a solid swim and crushed it on the bike and run. I was back in form. After Wyckoff we mixed endurance pace and some tempo workouts and added in some long rides and tempo bricks. I felt like the tempo bricks and long rides really helped bump my fitness to another level. The race started in cloudy cool weather with a threat of rain. Perfect conditions if the rain would hold off. Too bad that was not going to be the case. I felt good during the swim. Got in the water and settled into a nice rhythm. Since it was so overcast, sighting was easy and I managed to hug the boueys nicely. Although I swam well, my time was 41 minutes. Turns out the swim was almost a quarter of a mile long. Even the top swimmers found their times were a good 6 to 7 minutes slower than expected. Nothing to do but just press on and not panic. The bike course was fantastic. Nice roads and very few cars. The course was rolling with a few climbs. Early on the bike, I settled into my cadence and pace and felt really good. Passed a bunch of people and found nice open road. I really trusted in the training on the bike and rode a nice endurance pace based on the perceived exertion and power of the training rides I had done. Unfortunately, my hopes for the rain to hold off were dashed early on during the bike. Pretty much the entire ride was in either must or steady rain. Had to take it a bit easy on the descents and the turns but still rode a solid 2:45. More importantly, I felt great coming off the bike and was ready to push it on the run. As soon as I left transition on the run, the skies completely opened up and it started pouring as hard as it could possible rain. The run course, which was on hard packed trail, very similar to the Nyack/Piermont/Oak Tree rail trail, became like a run through a series of small streams and huge puddles. Knowing I was on a good day, I wasn’t going to let the rain stop me. After shaking off the “bike legs” during mile 1, I felt like it was time to put the hammer down. Again, I trusted in the training and tried to pace the way I paced during my tempo bricks. I was able to nail that pace and moved up a few places in the overall and moved into second in age group. I outran the guy who won age group by 13 minutes, but ran out of real estate to catch him.. I don’t think I ever felt so good on a half ironman run. When all was said and done, I ran a 1:37 half, 7:30 min/mile pace. My best half Ironman run ever.Overall I came in at 5:10, 2nd in age group and 10th overall. Huge thanks to Roger Aspholm of Finkraft for putting together the perfect recovery and training plan to get me from surgery a couple of months ago to a super strong race and a podium finish. Also big thanks to Westwood Cycle and Giant Bicycles for the awesome Giant TT bike. That bike performed flawlessly in some tough conditions.